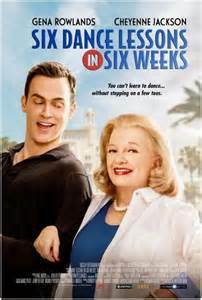 I went to see “Six Dance Lessons In Six Weeks” mainly to see Gena Rowlands and not expecting much of a movie. I figured it would be a second rate situation comedy with plenty of old people jokes and as it started it was just that. Rowlands, at 85, still has that luminous look she had 50 years ago, easily passing for 68, and delivers a first rate performance. Her co-star, 40 year old Cheyenne Jackson, proves he is more than just eye candy and the stereotype gay man as he appears in his role as a dance instructor. You know from the animosity and wisecracks shared between the two stars as the film starts that there will be a happy ending but somewhere along the way something strange happens as they become real people and problems such as being old and alone or gay and living a lie are talked about. Yes most are one liners to get laughs but both actors bring the underlining hurt they are feeling to the forefront and tears flow. Aside from the leads most of the supporting company are either wasted such as Rita Moreno--how do you have a movie about dancing and not have her dance?--or Jacki Weaver as a course cougar want to be with roaming hands. Julian Sands, as the dance studio owner, seems to be in the wrong movie. The only ones who come through unscathed are Kathleen Perkins as the dance studio’s receptionist and Simon Miller as Moreno’s son. “Six Dance Lessons In Six Weeks” was originally a two character play and except for Rowlands and Jackson the rest of the cast seem to be added just to open the play. The two stars not only hold the film together but--and I might regret saying this--make the movie A MUST SEE! I’ll sort of hedge that by saying Gena Rowlands is a film treasure and those who admire her, as I do, will love seeing her back on the screen and those who aren’t familiar with her are in for a treat. Sadly the film is not being pushed by the independent company that financed it nor is it playing in many theatres. The Gateway Theatre has it only booked for a week so in spite of my firm belief that a movie should be seen on a theatre screen-- and in this case the sunset which is a major part of the film’s ending should be seen that way--all I can suggest is be sure to get it on DVD or, like me, look forward to when it is shown on cable or network TV. What a delightful surprise on a March afternoon. I saw the original stage production in Miami with Rue McClanahan and Mark Hamill, and it was one of the funniest things I'd ever seen. I avoided seeing it and now I am sorry I did! Did you get to see the movie?